AFTER forty years of active association with brother Austin-Sparks in the things of God, it fell to me to lead the praiseful funeral service on April l9th, when a large number gathered at Honor Oak to magnify the Lord for our brother's long life and fruitful service. During most of those years I have been a contributor to A Witness and A Testimony, so I have gratefully accepted the opportunity of writing a short appreciation of our brother and his work for God. Those years were filled with many activities for God, but preaching was his greatest gift and his chief joy. He read widely in his desire for spiritual understanding, and above all he studied his Bible, always in an eager quest for the treasures new and old which can be found there by those who are instructed in the kingdom of heaven. One of his first choices for the supplementary hymn book which he prepared for use at the Honor Oak Christian Fellowship Centre was the hymn which carries [69/70] as its refrain Pastor John Robinson's famous reminder to the Mayflower pilgrims that "the Lord has yet more light and truth to break forth from His Word". How often we sang those inspiring words at the beginning of an Honor Oak Conference! And how often they proved true to the appreciative listeners! Especially in his earlier years, brother Sparks used to lay great emphasis on the need for the inward application of the Cross to the life of the believer. He preached a Gospel of full salvation by simple faith in Christ's sacrifice, but he further stressed that the man who knows cleansing by the blood of Jesus should also allow the same Cross to work in the depths of his soul in order to release him from himself, and lead him into a less carnal and more spiritual walk with God. He himself had gone through a crisis of self-undoing by his acceptance of the Cross's verdict on his old nature, and had found this crisis to be the introduction into an altogether new enjoyment of Christ's life so great that he could only describe it as "an open heaven". In the church life of the people among whom he ministered he had also seen a striking transformation produced by this message of the Cross to the believer: it was no wonder, therefore, that he took every opportunity of affirming that there is no other way into the full experience of the will of God than by union with Christ in His death. Again and again he would revert to the teaching of Romans vi, not just as a favourite topic, but out of a conviction that such union was the sure means of knowing the power of Christ's resurrection. The Cross is not only painful; it is unifying. Brother Sparks believed and preached that by it the individual believer is not only led into an enlarging personal enjoyment of resurrection life, but also into a true integration into the fellowship of the Church which is Christ's body. He could never think of himself as an isolated Christian, nor of assemblies as isolated groups, but he tried to keep before him the divine purpose of redemption, which is the incorporation of all believers into vital membership of the one body. It has sometimes happened that Christians most anxious to express this oneness have yet contradicted its spirit by being betrayed into an attitude of superiority towards other Christians, so allowing themselves to be wrongly divided from their fellows in Christ. We here have had to confess our own failures in this respect, realizing that our very eagerness to be [70/71] faithful to the Scriptural revelation of what the Church ought to be may have unintentionally produced something of a separateness among the people of God. If brother Sparks at times tended in this direction, he certainly moved farther and farther away from it as he came nearer to eternity, being growingly careful to show a proper appreciation of all true believers, whatever their connection. 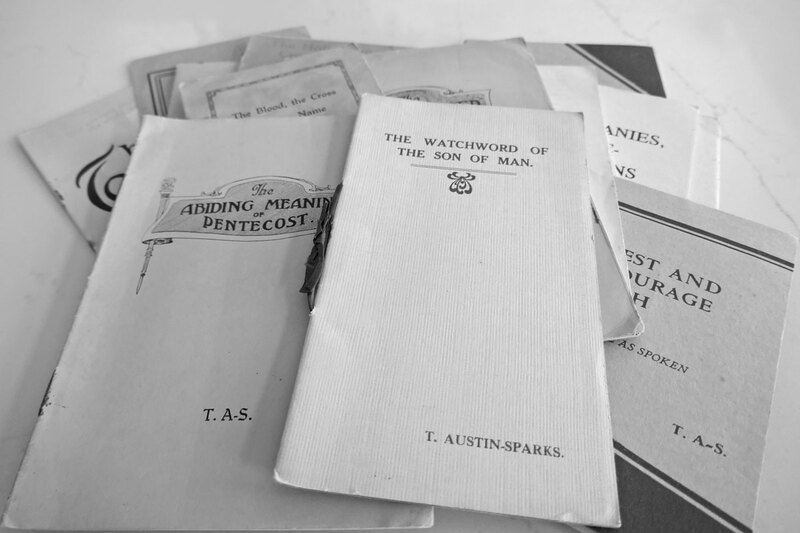 To brother Sparks prayer had many aspects as is shown by his book In Touch with the Throne. He set us an example of the prayer which is adoration, not requesting or interceding, but just offering to God the worship and love which are His due; he constantly stressed the importance of what he called "executive prayer", by which he meant not just wishful thinking with the tag of "Amen" at its end, but the bold claiming of God's promises in the name of the Lord; he introduced many of us to the reality of "prayer warfare", for he knew that only by getting to grips with the unseen enemies of God's will can the Church apply Christ's victory to actual situations. Because prayer is a battle he was sometimes saddened when our prayer meetings tended to flag, but he would rally us anew to the fight, and was always ready to rejoice when we seemed to break through into the victory of faith and to get "in touch with the throne". The very first message which I heard him give in 1924 was an appeal to those present to press on towards the mark for the prize, and it concluded with a reference to the abundant entrance into the everlasting kingdom which is promised in 2 Peter 1:11. Now, after forty-seven more years of the joys and trials of living for Christ, he has finished his course, and we trust that his entrance has indeed been rich and abundant. Although he has gone from us, his message still brings its challenge to [71/72] us who are left behind, and although his lips are now silent, his prayers for us will still be answered. AS it was not possible for a number of friends to be present at the funeral of Mr. T. Austin-Sparks, we felt it right to arrange for a special thanksgiving service to be held on May 1st. This took place at Honor Oak and was blessed with fine weather, as also the funeral had been. Mrs. Sparks and her family were present, and the halls were filled to capacity with friends who had gathered from near and far, including some from France and Holland. We commenced at 2:30 p.m. with the wonderful hymn of praise: "Christ is risen! Hallelujah! ", and the note of thanksgiving was sustained throughout the whole time, although of course some of the recollections of our beloved brother's long life and fruitful ministry were very moving. Mr. C. Fischbacher, an old and valued friend who had travelled down from Scotland, read the Scriptures from Philippians 3:7-14, a passage which had frequently been on brother Sparks' lips. Following the reading, Mr. Paul Wolff from Strasbourg led us in prayer. Mr. Wolff has had long associations with Honor Oak and Kilcreggan, and served brother Sparks as his interpreter at the Swiss Conferences. He was enabled of the Spirit to lift the whole gathering into true worship in which all the glory was given to God, so setting a tone for the whole service. Naturally there were many cables and letters from sympathetic friends: it was not possible for more than two to be read, one from the Atlantic States Christian Convention in the U.S.A., and the other from the elders of Jehovah Shammah at Madras, India. Mr. Fred Flack, who works in India and the Far East, read these letters to us, adding his own tribute in which he confirmed what the Indian brothers had written about the rich blessing which many had received through brother Sparks' visits to that land, as well as through his printed ministry. Mr. Flack spoke also of how a door of opportunity had opened for him in the Philippines through brother Sparks' presence and ministry of the Word in Manila. He then led us in further prayer, this time offering thanks for all God's mercies to Mr. and Mrs. Sparks in their numerous journeys to carry God's message East and West, committing to Him the many lives touched and influenced by our brother's labours. Following this, some reminiscences were given by Mr. John Paterson, the younger son of the man who, until he went to be with Christ in 1951, was brother Sparks' closest colleague. Continuing, Mr. Paterson said that his sense of outstanding indebtedness to brother Sparks was for what he could best describe as "The Grand Design", that is, the realization, based on the Scriptural phrase "the eternal purpose", that God is working to a plan. He stated that what he had personally received and what he is quite clear that he did not get anywhere else, indeed what he barely heard hinted at anywhere else, was the sense of things hanging together in the spiritual life, all being underlaid by one single purpose and moving towards one single goal which God has set for Himself. In this way [72/73] he had, he felt, been given an insight into "the goings of God", and further asserted that those who had come to see something of this eternal purpose of God had found themselves striking a distinctive note among God's people wherever they went. He proceeded to stress that, although brother Sparks had laid down spiritual principles for us, he had not described the way in which they should be put into operation, but had left us with a research frontier, so that the task of the present generation is to get from God guidance as to how this should best be done. After this, we rose to sing our second hymn: "Jesus, Thou joy of loving hearts", and then Mr. Harry Foster spoke of brother Sparks as a pupil, as well as a teacher, in The School of Christ, remarking that perhaps the most helpful feature of his preaching was when he was able to interpret to people the divine meaning of their own experiences, explaining to them from the Word just what lay behind the things they had been going through. Those who were perhaps puzzled as to what it was all about received fresh understanding of God's intentions and an interpretation of how God was dealing with them in the light of His eternal purpose. Mr. Foster reminded us that while brother Sparks' chief gift was concerned with a teaching ministry, he was deeply concerned to win men for Christ, not only in his teenage witnessing activities, but all through his life, until he fulfilled his very last preaching engagement this year, which was to a group of London City missionaries. He had a wonderful ability to convey the nearness of the Lord, and the melting tenderness of His love, which has left fragrant memories to those who listened on such occasions. "The old, old story of Jesus and His love" was ever new and precious to him. Mr. Foster made no apology for speaking entirely about the past, since many friends were gathered especially to express their gratitude to God for all His blessings, but he pointed out the need to face the future, and for this purpose introduced two of the younger generation. The first was Mr. Roger Forster, who gave a brief message on the passage of Scripture which had been read earlier, particularly stressing the need for the singleness of purpose represented by the phrase: "This one thing" (Philippians 3:13). He said that he had first met brother Sparks thirteen years ago, and after some hours of fellowship in which each told the other of God's dealings with him, brother Sparks closed the time with prayer. He knew that Mr. Forster was going to take a meeting, really a very small affair with a handful of youngsters, but he prayed for the coming ministry as though it was the most important in all the world, as though indeed it might be the last. By that prayer he conveyed this quality of dealing with each apparently trivial moment as truly important in God's eternal purpose, and though Mr. Forster could not claim always to have lived at that level, he was constantly reminded, and wished to stress to all present, that the true spirit of Christianity is the maintained attitude of "this one thing". The "one thing" is, of course, the prize, and the prize is Christ Himself. Mr. Forster sought to reinforce Mr. John Paterson's earlier plea that we should try to discover from God how to bring the power of His eternal purpose right down into this confused, permissive age of ours. Paul found how to do it in the first century; brother Sparks sought to exemplify it in his generation; now, although in such new conditions, the present generation must heed the call to serve God in the same way. To follow this, Mr. Alan Barrow, another of the new generation, brought the whole matter to God in a final prayer of thanksgiving and rededication to the "one thing" of God's eternal purpose. On this note the service ended as with great enthusiasm we sang: "HOW GREAT THOU ART!" Men (and women) of stature -- (Isaiah 45:14; Ephesians 4:13). In whom the Cross has done a deep work as to self-interest. Who are not so concerned to preach, or to try and influence others to a doctrine or theory, but whose main influence will be one of LIFE. Who have come to know the Lord in a way of proving. Whose reaction to every situation, circumstance, and proposition is: 'Does it glorify God? ', and whose Touchstone by which all things are tested and determined is: 'Can it work out to an increase of Christ?' For such there is a pressing need, in the Church, in the Lord's work, and in all the nations. AS you know, we are in these mornings occupied with the Holy Spirit's biography of Jesus Christ which He is writing in the spiritual history of believers. Last time we commenced a new chapter in this biography, the chapter which contains the baptism, the anointing and the temptation of the Lord Jesus, which, as we saw, are three parts of one thing. Each depends upon the other, and they should never be separated, but, because of lack of time, we had to break off after the second part. So now we shall take part three, the temptation of the Lord Jesus in the wilderness. It is very important that we should recognize what is the setting of the temptation, for it is not something in itself, nor just an incident in the life of the Lord Jesus. It has a very long history, going right back to the Garden of Eden and the first Adam. May I just say here, to help you in your Bible reading, that it is always important to see any part of the Scripture in relation to the whole, and to see how it fits in to the whole revelation. This is a very special example, for this temptation in the wilderness, as I have just said, takes us back into the Garden of Eden and brings us alongside of the first Adam. As you know, that man was put on probation. The question he was going to answer was: Would he live by Divine life, or would he live in himself and not in God? Would it be a matter of God being everything, or, as Satan suggested, man being self-sufficient. That was the issue of the two trees. The one tree, the tree of life, was a symbol of the Divine life by which God wanted man to live, and the other tree, the tree of the knowledge of good and evil, was the symbol of man being sufficient in himself. So it was a question of whether man would be absolutely dependent upon Divine life, or whether he would depend upon himself. Well, we know that Adam failed, and the immediate result was that he was driven from a garden into a wilderness, and the Lord said that the ground would bring forth thorns and thistles -- in fact, everything that spoke of a curse upon the earth. So the first Adam, because of this wrong choice of life, found himself in a wilderness, and the wilderness represents man making a false choice. Adam broke down in his probation. Now we pass over some centuries and come to Israel, and this same issue was presented to them. It is the key to their history. When they were brought out of Egypt into a wilderness for forty years (and I hope you are reading Matthew 4 in this: Jesus was in the wilderness for forty days and forty nights, so the same principle is there) the question was: Would they live by Divine life, or, in rebellion, seek to be self-sufficient? Well, we know that in that probation Israel also failed. So God presents the same question to a man and to a nation: 'Will you live by My life, or will you be sufficient in yourself?' The wilderness is certainly a good place to test that! God is very practical. If He puts us in a wilderness the question does indeed become very practical: Can we meet the situation here, or will it only be possible by God being our sufficiency? That was the question with the first Adam and the first nation, at least, it was the first nation so far as the Bible is concerned. Now we come to the third thing. First Adam, then Israel, and then the last Adam, and we find Him in the very place where both the first Adam and the first nation failed. He is in a wilderness, and He also is on probation for forty days and forty nights. You know that the number forty in the Bible always means probation, a time of testing. Now the issue with the last Adam is exactly the same as it was with the first: Will He live in absolute dependence upon God His Father, or will He take up this life-vocation in His own strength? That test was a very practical one, for it becomes very practical if you have not had anything to eat for forty days and forty nights! It is a matter of how you will get something to eat, for it looks as though you will die. So at that point it was a question of life or death, but the question, of course, was deeper than just the matter of bread, which is what we come to here: "Man shall not live by bread alone." It was a question of whether He [74/75] would face this life work just on a natural basis or on a Divine basis, of whether He would try to find the resources in Himself alone, or in His Father. The Lord Jesus answers that in John's Gospel when in chapter five He says: "The Son can do nothing out from himself", for that is the force of the Greek word. It is not in Him to do it, and that is the position that He has accepted voluntarily -- absolute dependence upon His Father. 'The works that I do, I do not out from Myself. The words that I speak I do not speak out from Myself: It is the Father who doeth the works, and it is the Father who speaks the words.' Jesus had accepted that position, but there was a tremendous battle connected with it. I think there is a lot of history behind that. The Lord takes away our own strength and our own wisdom, and makes us dependent upon Him. That is the principle of heavenly vocation. Now we come to the three temptations, and we must remember what is the issue that is involved. The issue is vocation, that for which we are here, and, as I have said, we are here to make a place for the Lord. These three temptations are immediately connected with that vocation. We must see how each temptation is related to this vocation, because the object explains the methods of Satan. Do you understand that? Satan knows what our presence means to his kingdom. He knows quite well why we are here, just as he knew why the Lord Jesus was here, and so he must defeat that end in some way. He works very subtly and increases his temptation as he goes on, but he knows what he is after at the end. The whole question is that of the basis of life. The basis of the Christian survival, and the great basic factor, is Divine life, and Satan has always wanted to defeat that. In the Garden of Eden and with Israel his one object was to defeat Divine life. In the first temptation Jesus is in physical weakness through lack of food, and this is a question of His very life. Satan comes to Him in His weakness and says: 'If what was said at the Jordan be true, and You are the Son of God, command these stones that they may be made bread.' What did Jesus answer? "It is written that man shall not live by bread alone, but by every word that proceedeth out of the mouth of God." The first thing about this life-bread is that it is a different kind of life from natural life. That is what is hidden in this first temptation. There is a great deal of difference between natural life and Divine life. I think we should notice that the Lord Jesus, in quoting that Scripture from Deuteronomy 8, quoted it correctly. Presently Satan is going to quote the Scriptures, but he is going to do so incorrectly, and that is one of his ways. He takes up Divine things and gives them a twist. In quoting that Scripture the Lord said: "Man shall not live by bread alone." He did not say: 'You do not need any natural bread.' There are certain kinds of Christians today, and have always been through the ages, who think that they are very spiritual because they starve themselves. They fast as much as they can, usually looking very miserable. They are always very finicky about their food -- and they think that is being very spiritual! But the Lord does not say that that is what we are to do. He says that there is the natural bread, but that is not the only thing, for there is a bread which is much more important, and that is the true bread. That is quite different. How men are trying to fulfil the work of God on natural grounds! Their resources are natural resources which are produced by themselves and the Lord says: 'No!' There is all the difference between the earthly and heavenly worlds, between natural life and Divine life. But that life is not only different; it is something extra. It is not bread only, but something more than that, something extra to the natural. You may have your breakfast in the morning -- and there is nothing wrong in having a breakfast, or any other meal -- but if you think that you are going to do the work of God on a good breakfast, you make a mistake. Do you see what I mean? This is something extra to the [75/76] natural, something much more than anything that natural food can give us. It is the great Divine extra. You see, we are repeating the life of Christ, and I can give you examples from His life. Just take one: His meeting with the woman of Samaria. The Lord Jesus, being wearied with His journeys, sat on the well and sent His disciples into the city to buy bread. Then the woman came from the city, and you know the conversation they had and how the whole of the life of the Lord Jesus was poured out to that woman like living water. As He spoke of heavenly things, as He gave to that woman the heavenly secrets, and as He spoke about the heavenly life, deeper than that well and more eternal than the water of that well, although it was Jacob's Well, all His weariness went and He was a renewed Man. The disciples came back to Him with their loaves and said: 'Master, eat.' Then they looked at Him. 'Has anyone given Him bread to eat? What has happened to Him? Why, He is a new man and He does not want our bread.' You see, He had been talking about life, and it is no use talking about life if you are not an example of it. He said: "I have meat to eat that you know not.... My meat is to do the will of him that sent me" (John 4:32, 34). Think about that for a little and remember that you are dealing with these eternal principles. This is the extra bread, which is more than the natural. Some of us who minister a great deal find that when we face new ministry we often feel very weary, and naturally the question is: 'Can we do it? Can we get through that long conference?' But when we get to the end of the conference we have new life. It really is like that. The fact is that when tomorrow night comes and this conference is over, I shall have just as much in hand as I have given all the week -- and we shall want another week! Well, I am not an example, but I am trying to enunciate the principle: "Not by bread alone, but ..." This is one of those very many occasions when those two words are put one against another -- "Not ... but ..."
There is one other thing: This Divine life is a matter of faith. The Lord Jesus said: "By every word that proceedeth out of the mouth of God." Well, there is the word in writing in the Bible, but do you think it is enough for it to be the Word of God, written in the Bible? No, you have got to lay hold of it by faith, and we have to lay hold of this life by faith. You remember the woman who came to the Lord Jesus in the crowd and said: "If only I could touch the hem of his garment I would be made whole", and although the multitude was pressing on Him, there was no one else in that multitude who received that life. It was that woman's hand of faith, and the Lord Jesus said: "Thy faith hath made thee whole." Laying hold of the word of life by faith is something that we must ever do. Paul says: "Lay hold on eternal life" (1 Timothy 6:12), for it is there. Really exercise faith about it. These things may seem very simple to you, but they are very important and real. The passage that the Lord Jesus used in answering Satan is from Deuteronomy 8:2 and 3, and you need to look at the setting of it. It is at the end of the forty years in the wilderness, and says: "Thou shalt remember all the way which the Lord thy God hath led thee these forty years in the wilderness, that he might humble thee, to prove thee, to know what was in thine heart, whether thou wouldest keep his commandments, or no. And he humbled thee, and suffered thee to hunger, and fed thee with manna, which thou knewest not, neither did thy fathers know, that he might make thee know that man doth not live by bread only, but by every thing that proceedeth out of the mouth of the Lord doth man live." What have we here? The people are not going into the wilderness now, for they are going over Jordan into the land, but there is a history behind them. For forty years God has proved that there is a life other than the natural. Do you not think that that is a good thing? You might say to me: 'You are talking about this Divine life, but prove it.' Well, I can give you more than forty years -- but no, I am not talking about myself. I am talking about the history of the Church, and that is two thousand years. Has the Church continued through these many centuries by its own strength? Has the Church been in many a wilderness? Has there been much starvation? Yes, again and again the Church has been in a terrible wilderness, with death all around, and with nothing in this world to support it. It could have died again and again, but it has not died. It is alive today, and there is a great history of the Lord's Divine support. And what is true of the Church is true of the history of many a believer. Many of you could say: 'If it had been left to me I would have been dead today. My very survival is a testimony to something supernatural.' Is that true? Oh, yes, it is true, and it has to be true to the end. So here we have a history behind what the Lord Jesus is saying, and He is able to put the strong proof of history into His words when He answers Satan. Now the Lord Jesus is in a wilderness, but what [76/77] is He going to have to meet in the next three and a half years? I do not think that Satan is going to stop at anything to kill the testimony of Divine life in Jesus. Again and again he makes an attack upon His life in every possible way in order to quench the testimony of Jesus, but He goes through. He lives, and He lives today, for that Divine life has triumphed over everything. That biography has to be written in your heart and in mine. We are in a wilderness -- or do you think that your Christian life is the Garden of Eden, with everything so lovely and with everything in the world that you can want? Is that how it is with you? Well, of course, it is very nice here at Hilterfingen, but you know quite well that you have to go back. You may feel like Peter: "Let us build three tabernacles and stay in Hilterfingen for the rest of our lives! ", but it may rain next week, and, even if it does not, you know you have to go back to your difficult situation. That may be very much like a spiritual wilderness, but you have this great truth: there is a Divine life, which is a different life, an extra life, and you can live by that life wherever you are. I suppose there are few more difficult situations than those in which our dear brother Watchman Nee has been for eighteen years. As far as we know, he is alive, and I believe that his spiritual testimony is still alive -- and that is a miracle. We may not have his experience, but we may know the wilderness, and God can prepare a table in the wilderness. The point, then, of the first temptation was this: Would the Lord Jesus use His own powers to save His own life, or would He depend upon God? Later on He will say: "He that loseth his life for my sake shall find it" (Matthew 10:39), and that is the principle. Satan has failed on that ground, so he is going to change his position, for he is not giving up yet. Now we come on to the methods of fulfilling our vocation. Satan took the Lord Jesus into Jerusalem, set Him on the pinnacle of the temple and said: "Cast thyself down." Now Satan quotes Scripture, trying to take Christ's own ground and defeat Him there: 'You believe in the Scripture, do You? You are thinking of the Word of God. All right! Now it is written: "He shall give his angels charge concerning thee: and on their hands they shall bear thee up, lest haply thou dash thy foot against a stone."' I say that Satan misquotes the Scripture, for is that what Psalm 91 really says? If you read that Psalm you will find that Satan left out the most important clause: "He shall give his angels charge over thee, to keep thee in all thy ways " (verse 11). There are some ways in which the Lord will not keep people, but Satan leaves that out. Yes, Satan is quoting Psalm 91, and what are "the ways" in that Psalm? I think it is very impressive and almost humorous. That Psalm begins by saying: "He that dwelleth in the secret place of the Most High", and that is the man referred to throughout the Psalm. Jesus had chosen to make His dwelling in the secret place of the Most High, and every Christian knows what that is. You have a hidden life with God, and you abide in that. Have you a hidden life with God, a life that this world does not see, a sanctuary with God, a secret place with the Most High? Will you come out from that? You see the subtlety of Satan! 'Come out from Your secret place and adopt some worldly methods of fulfilling your vocation! Cast Yourself down and everybody will say: "This is something very wonderful! ", and You will have all the people in Jerusalem rushing to You. They will say that You have come down from heaven, and You will be the most popular man in Palestine!' -- and it will have been done by a trick. It would mean that the Lord Jesus was party to something in the natural man which likes to have evidences and proofs, for, you see, everyone in Jerusalem sought for a sign. They said to Him: 'Show us a sign and we will believe. Give us some evidence. Give us some proof that we can see and we will be Your followers.' This is the temptation: Use some methods in the work of the Lord which will make you popular, something that will appeal to the sensational in man, some tricks. Do you see what I am talking about? Is this not what the Church is trying to do? It is trying to recover its lost power by a lot of tricks, by playing to this thing in man that wants the sensational. Surely we can see that this is what is happening! The methods that are employed in the work of God to attract the crowds, to get big meetings, are to satisfy this desire for proofs and evidences. Perhaps never in the history of the world has there been so much of this. I do not want to be critical, nor to judge too much, but I have a very great question about the guitar, and a lot of other things that are employed to try to make the work of God successful. That was what was in this pinnacle of the temple. You will get the crowds if you do that kind of thing, but you may come out from the secret place of the [77/78] Most High, that hidden place from the world which is the place of power. I can only just drop these hints, but I know what I am talking about, and I do believe, dear friends, that all we need is the power of the Holy Spirit in the Gospel. I do not believe that it is necessary to have all this other stuff. I believe that where there is reality, people who really want reality will go there, and people who do not want reality, well, just let them stay away! Perhaps you do not agree with that, but I am talking on Divine principles, on the principles of the life of Jesus Christ, and I am saying that these principles of Christ have to be written in His Church. We come to the third temptation, and Satan is now moving his position. He is gradually being uncovered and it is now going to be manifest what it is he is really after. He himself knows what he has been after all the time, and he has been moving steadily towards it. He took the Lord Jesus up into a very high mountain. I do not know, of course, how that was done, though I do not think that it was done literally. I think that the Lord Jesus was seeing all this in a spiritual way. However, in that high mountain Satan showed the Lord Jesus all the kingdoms of the world and said: 'I will give You all this if You will fall down and worship me.' Ah, now it has come out! Satan knows what Jesus Christ has come into this world for, and that is to bring in the Kingdom of God. He knows that this One is destined to be the Divinely-appointed Lord of the universe. If Satan knew the Scriptures in Deuteronomy and Psalm 91, he also knew them in Psalm 2, which shows the final exaltation of God's Son. Satan knew that before the world was. His demons know this One, for on one occasion they said to Him: "What have I to do with thee, Jesus, thou Son of the Most High God?" (Luke 8:28). So the ultimate issue is world dominion, and that is the one thing that Satan is against, for he is the god of this world and he is not going to have that position taken from him by anyone. But see how clever he is! 'I will give it all to You without You having to go to the Cross. You can have it all without suffering if only You will do one thing -- put me in the place of Your God and worship me. And if You do that I know quite well that You will not get the kingdoms of the world. My kingdom is established, and what You came for will be defeated.' That is what lies behind it all but what is Satan really saying? 'Compromise with me as the prince of this world' -- and if we compromise with this world we are going to lose our spiritual dominion now and afterwards. You see, it is the Church that is going to reign. There are some things in the Bible that I do not understand. For one thing I do not understand what Paul meant when he said: "Know ye not that the saints shall judge the world? ... Know ye not that we shall judge angels?" (1 Corinthians 6:2-3). I do not really understand that, but I do know that it is in keeping with the whole revelation of the New Testament: "If we suffer with him we shall reign with him" (2 Timothy 2:12). He will give us the Throne with Himself. That is what we are called to, and is the purpose of the vocation: to govern this world in the place of Satan. Is that not a tremendous thing? That is the destiny of the Church. So Satan sees that the way to defeat that destiny is to compromise with the world, but you cannot cast out Satan by Satan, nor can you cast out the world by the world. The Church has tried to do that, and it has lost its position and its power. It is in a poor state today, and the reason is that it has compromised with this world. It may have had a right motive -- trying to win the world on its own grounds -- but it takes more than a guitar to beat the devil! You will never overcome the world by worldly means and methods. 'Thou shalt worship the Lord thy God only.' You must give Him the supreme place in this universe. 'And Him only shalt thou serve,' not Satan, nor the world. What is the service of God? Remember Mary's service -- bringing the Lord into His right place, taking ground for the Lord and holding it for Him. But what a battle! The enemy and all his powers are set against it, but thank God for the anointing! It is said that the Spirit which had come upon Him drove Him into the wilderness to be tempted of the devil, but it does not say: 'to be defeated by the devil'. He was anointed to test out the strength of this great enemy and break it, and the anointing carried Him through in victory. DURING this week, from morning to evening, we have been concerned with realities. We have a risen Lord who loves us, even though He knows us. We have not been gathered here to discuss religion, nor to teach one another pious attitudes, nor to pray pious, unreal prayers, nor to teach one another pious, false humility. We have not been here to speak to one another about illusions, for the Kingdom of God is not in words, but in power. Reality is the real power. There is not much power in speaking about joy, but there is a lot of power in having joy. There is not a lot of power in speaking about peace, but what a power there is in having and knowing peace! There is not much power in speaking about redemption, but to have and to know redemption is power indeed! It is the same with the resurrection. It is one thing to talk about it, but quite another thing to know the power of His resurrection. That is what we have been gathered around during this week -- power. Not the popular conception of power, which is spectacular and emotional. Actually, there is not very much power in working ourselves up emotionally for if we try to do that we find that it does not last very long, and we come down again. But we do not need to work ourselves up if we know that the Kingdom of God is power and we know that power -- the power of eternal life, of reality, of joy, of peace? of righteousness, of the risen Lord Himself. That is the power of reality based upon the mighty acts of God in which men have played no part at all. We read about them in 1 Corinthians 15, verses 3 and 4: "For I delivered unto you first of all that which I also received, how that Christ died for our sins, according to the scriptures, and that he was buried, and that he rose again the third day according to the scriptures." As Paul saw that, through the spirit of faith and in living contact with his risen Lord, something wonderful happened. We read his testimony in verse 10: "By the grace of God I am what I am." Does that sound proud? No, not at all, for it is real. It would have been false humility to say: 'By the grace of God, I am nothing.' Is there not more power in the grace of God than that? But what about Paul? Paul was "always abounding in the work of the Lord". Of course he was, for eternal life is like that. Would you like him to testify: 'By the grace of God I accomplish nothing!'? Would it be humble to speak like that, or pleasing to our risen Lord? Would it have been very humble for him to say: 'I have done everything I felt I should, but I feel that it was all in vain.' 'Ah,' you say, 'that is very humble! Nothing comes out of what I do, for I am so small and insignificant.' You know, when we say that we are insignificant, it almost always proves that we want to be significant! "By the grace of God I am what I am: and his grace which was upon me was not in vain; but I laboured more abundantly than they all; yet not I, but the grace of God which was with me." We must speak like that if we have the spirit of faith, and, therefore, through that spirit we are humble, boasting only of the Lord. We do not speak very much about ourselves, but of the Lord as Paul did here. It is all real, it is power. Therefore, it is quite reasonable for Paul to say in verse 58 of this chapter: "Therefore, my beloved brethren, be ye steadfast, unmovable, always abounding [79/80] in the work of the Lord, forasmuch as ye know that your labour is not in vain in the Lord." This is the spirit of faith, and is what John means when he says: "This is the victory that overcometh the world, even our faith" (1 John 5:4). As we are filled with that spirit of faith, so, even before we enter into any kind of work, we know that it is not in vain, and that it is purposeful. We have done it and accomplished it before we start doing it! It is not an experiment that can be either a success or a defeat, for it is prepared by the Lord. We are what we are in Him, and therefore we are not living in the world of experiments. Jesus did not experiment when He walked down here, for He walked with His Father. He knew that what He was doing would lead to the goal, and we know the same. By the grace of God we are what we are, and His grace has not been in vain. We have worked, but it is the grace of God and not we ourselves, so it bears eternal fruit. That does not make us full of pride, but neither are we humble in an illusory way. We are free to be ourselves in the Lord, giving all the glory to Him, feeling that it is a miracle of grace that we are in touch with reality, out of the world of illusions and in contact with God day by day, doing His work through the spirit of faith, both on good and on bad days. I once met a lovely young Salvation Army girl. I only met her once, and have never spoken to her, but she made an unforgettable impression upon me. She had blue eyes, fair hair and red cheeks. She was in a tramcar in which I was also travelling. As she sat there her cheeks became redder and redder, her eyes became more and more strained -- and as the tram stopped she took out a tract, gave it to me, and jumped quickly off. She was the Lord's servant! She did her very best -- and I suffered with her! She had been sitting in that tram for ten minutes thinking of the tract in her pocket and of me in the tram, and there was a struggle going on. At the last minute I received the tract and off she jumped! By the grace of God we are what we are, and in Him we are steadfast and unmovable. Rely on Him! Do not experiment in one way or another, but walk with Him, and He will give you the words to speak. Then came our friends from Operation Mobilization to buy a Danish ship, and they went to my friend's office to have all the papers put in order. Then not only just one person, but all the people in that office came into contact daily with people who were buying a ship for use in the work of the Gospel. They had never had that sort of business before, so they asked questions, and my friend could speak about the Lord to one after another, without shivering with fright and without counting how many tracts he still had in his pocket. By the grace of God we are what we are. His grace is not in vain. "Have faith in God." Be what you are -- a Christian, one who is spiritually risen from the dead, risen from sin, Satan and fear, [80/81] and living just this very moment with that risen Lord. An English brother came to us once in Copenhagen and said from the platform: 'I wish missionaries would tell the truth! I always hear wonderful stories from the mission field. They pray and God answers; they are in a difficulty, and God intervenes. I would like them to tell the truth and say: "We were in a difficulty and the Lord did not intervene. We prayed, and it was as if we could get no answer."' Wonderful stories are good, but not good enough, for they do not convey the whole truth. We live with the risen Lord, so we can have difficulties, we can have darkness, we can have unsolved problems and we can carry burdens. We live with the supreme Lord, but He cannot always spoil us. He must train us, discipline us. He does not answer our prayers, so our faith is tested, but we have Him and we learn. Then the life we have which, in some way, is already full and complete, grows through our experiences, through our testings, through discipline, through unanswered prayers, and through problems, but it is all grace, for the Lord governs everything. He is supreme. He can take the burden away this very moment if He wants to, but if He does not, have faith in Him. It is very important to speak the word of faith. Do you know what the Lord Jesus said on the very last night? He said: "Righteous Father" (John 17:25). That is the last thing that we would have said, for He was being treated in the most unrighteous way, darkness was falling upon Him, and yet He did not say: 'Holy Father', or 'Mighty Father.' He said: "Righteous Father" -- 'You are right.' That is the word of faith. We have a risen Lord, but He was crucified, and the marks of the crucifixion can still be seen in His hands and feet. He has given us a Divine calling. Peter defines part of that calling in words that we do not normally like: "For this is thankworthy, if a man for conscience toward God endures grief suffering wrongfully, for what glory is it if, when ye be buffeted for your faults, ye shall take it patiently? but if, when ye do well, and suffer for it, ye take it patiently, this is acceptable -- this is grace -- with God, for even hereunto were ye called" (1 Peter 2:19-20). Is it not wonderful to realize one's calling? Do you know anything more satisfying for a man than to reach that for which he has been called? He feels life abundant in himself, and satisfaction to the utmost degree. Here is one part of our calling: To follow our Lord, not grumblingly, not with fear that would paralyse, but with faith. "By the grace of God I am what I am." I am His. He is my Lord. What an honour to be identified with Him! I have His name, so why should I not share His fate? There is nothing about which to be fearful, but we should rather glory in Him. So James speaks the word of truth and reality, the word of faith, when he says in chapter 1: "My brethren, count it all joy when ye fall into divers testings, divers trials." That was not a piece of good advice, nor was it James saying something which he did not mean for himself. He meant it, for it is the word of reality, of truth. When we have taken that in there is nothing more that has any power over us. All things belong to us, whether they are the things that are now, things that will come, or death itself. Everything belongs to us, and we belong to Him, and so we say: 'By the grace of God, and that grace only, I am what I am, and His grace has not been in vain. I have worked, yet not I myself, but the grace of God.' And so we go on, steadfast and unmovable, knowing that our labours in Him are not in vain. The Kingdom of God is powerful. We do not speak very much about joy now, because we have it. We do not speak very much about peace, because we have that, but we talk all the day long about our wonderful Lord in whom we have found everything. We do not say to Him: 'Father, please excuse me. I cannot do Your will because You have not given me the power.' No, rather we say: 'Speak, Lord, for Thy servant heareth and doeth, through Thee.' - P. M.
In fitful clouds of spray. Of quiet urgency. SPLASH! As Donald leaned over the side of the ship he could just see where the anchor had fallen into the water, and presently he watched the chain tighten up as the vessel was held firm to its position. Their journey was near to its end; in most of the ports the ship had drawn alongside the quay, but on this occasion they had to wait out in the bay for a whole day, and so the ship was still and steady, riding at anchor. Now Donald's friend knew more about anchors than he did, so he immediately challenged this last remark, commenting: 'anchored in the mud would be more correct'. They were both members of a Crusader class, and Donald had often sung the chorus: "We have an anchor ...", so he rejected his friend's correction, insisting that of course their anchor was embedded in the rock, for otherwise the ship would be drifting away. His friend said that this was nonsense, for the anchor had to grip into the soft sea bottom, and then it could be hauled up again when the ship wanted to sail. Donald disagreed; the argument became fierce and as neither knew much about it they were glad to see the third officer approaching and decided to ask him. His answer made fun of Donald's idea for he confirmed that the anchor was gripping into the muddy bottom, and said that if the bed of the bay had been rock, then their anchor would have just bounced off it, and by now the ship would have been dragging out to sea again. Oh dear! Was the chorus wrong? Was the Bible perhaps wrong? What could he believe? Donald's sense of doubt and insecurity grew. He felt that he had been misled, and he got into such a state that when the voyage was over and he was back home again he almost decided not to go to Crusaders any more, as he felt that he was not told the truth. Happily, though, he did go again, and he was sensible enough to ask the leader what was the truth about anchors. The class leader was not sure himself, but he promised to make enquiries, if possible before the coming Sunday. He found the right man, and when he had put his question he received an answer which helped him in his own spiritual life as well as settling Donald's doubts. Around the world's coasts, including our own, there are lightships which must remain in a fixed position in order to give navigational help to sailors. These lightships do not have an ordinary ship's anchor, the kind that can be raised and lowered, for they are not made to travel, but to remain stationary. For this purpose they have to be held by special anchors which bore into the rock or solid ground, so remaining permanently fixed. So the Crusader leader was able to explain this to Donald and to point out to him that it all depends what you want to do with your life. If you want to be always nerving about spiritually, shifting and drifting from one thing to another, then it will be good enough to have an anchor in the mud; but if you want to be spiritually steadfast, giving out to other travellers a light to guide them on their way, then you must have a different kind of anchor, the one that goes deep down into the rock and stays there. "Jesus saith unto her, Said I not unto thee, that, if thou believedst, thou shouldest see the glory of God?" (verse 40). "For the glory of God ... thou shouldest see the glory of God." YOU probably know that chapters 11 to 17 of this Gospel are chapters of summation, and consummation, that is, a gathering up of everything into finality, and what comes out with great clarity in this consummate part of the Gospel is the priority which governed the whole life, the teaching and the work of the Lord Jesus. It seems that that is what John had in mind when writing, for he placed this priority right at the beginning of his Gospel, worked steadily along that line, and then brought it all out in this full and conclusive way at the end. Although the Lord Jesus had been governed by this priority for thirty years and more, there came a crisis point in His life at which He made a complete adjustment of everything upon this one thing that we are calling the priority where He determined that everything should be focused upon it, and that there should be no deviation at any point from it. And what was His all-inclusive priority? It was the glory of His Father -- the glory of God. As I have said, John struck that keynote right at the beginning when, writing after it was all over and seeing the whole content and significance of that life, work, teaching and conduct, he started off by saying: "We beheld his glory, glory as of the only begotten from the Father" (1:14). That is bringing the Father right into view in the matter of glory. Then John went on writing the Gospel, like a great harmony or symphony tuned to that keynote, and all the way through he kept true to it -- the glory of the Father. And I believe, dear friends, that that is the keynote that the Lord wants me to strike at this time. It is a very considerable burden with me in these days. Let us turn to the Lord Jesus Himself in this matter. There was in His life that hour of His great committal, which took place at His baptism. He there and then committed Himself utterly to the glory of His Father. He gathered every detail of His life from that moment and centred it in this thing, as though He were saying: 'From this moment there is to be not one deflection from that motive and object. My Father's glory is to govern everything.' And it was so. Firstly, the committal was in His own personal, inner life, in His secret walk with His Father. This is a most impressive thing as you read through the Gospel. You find all the way along that everything is coming out from His personal, secret life with His Father. "The Son", He said, "can do nothing of himself [or, out from himself], but what he seeth the Father doing " (5:19). Mysterious language, but those who know anything about life in the Spirit know what it means. "For what things soever he doeth, these the Son also doeth", and not in His own way, but "in like manner." How meticulous and how exact! His committal as to His own relationship with God His Father meant that there was nothing out from Himself, but only that which He knew in His own heart, and from His secret history with God, the Father wanted Him to do and to say. The background, inner sanctuary life with the Father was maintained unbroken. As to His conduct, He behaved Himself on this ground: 'How I behave, how I conduct Myself is going to be altogether a matter of how it touches My Father's glory. The impression I make upon others, what they see in Me and about Me, must never for one moment veil the glory of My Father, hide that glory, or detrimentally affect that glory. My behaviour must always be for the glory of My Father.' This was as to His conduct, His walk. You know, John made a special note of His walk, for it was not just an outward progress. John said: [83/84] 'He that saith he abideth in him ought himself also to walk even as He walked" (1 John 2:6). There was something about His very movements that was governed, and His walk, His movements, His behaviour were always for the glory of His Father. As to His works, we have already quoted Him: "The Son can do nothing out from himself, but what he seeth the Father doing: for what things soever he doeth, these the Son also doeth in like manner." And His words: "The word which ye hear is not mine, but the Father's who sent me" (John 14:24). Then His times for doing things. Ofttimes we read that He put back suggestions from others that He should do things now, at this time. When something seemed to be demanded of Him, and people expected Him to do it at that time, He put it back: "Mine hour is not yet come" (John 2:4), but He did it very quickly afterwards. He was waiting and in His spirit He was saying: 'Father, is this Thy time?' You know, dear friends, you can do a right thing at a wrong time and it just does not work out. We do a lot of things, and they fail because it is not the time for them. You remember the great incident in the Apostle Paul's life: "They assayed to go into Bithynia; and the Spirit of Jesus suffered them not" (Acts 16:7). They were "forbidden of the Holy Ghost to speak the word in Asia" (Acts 16:6). Paul was diverted, for it was not the time. They got to Asia and Bithynia subsequently, in God's time, and when God's time is registered things are very much more fruitful, for you do not waste time. When we do things so often in our own time, we really are only putting them off to God's time, for nothing happens until God wants them done. That is by the way, but that is how the Lord Jesus worked: "Mine hour is not yet", and then the hour seemed to come so quickly afterwards. He was governed in the same way in His attitude towards men. As to the religious world, He would commend what was sincere and go as far as He could with it in sympathy. A young man came and told Him that he had kept all the commandments from his youth up, and Jesus "looking upon him loved him" (Mark 10:17-20). He did not condemn. He was sympathetic to sincerity, but bring hypocrisy into His presence and His commending changed into condemning! There was nothing that brought out His wrath more than hypocrisy in religion, because it is a thing which robs God of His true glory. These are all things that made up the life of the Lord Jesus, and, as you see, His priority governed everything and was over a lot of things. It was over natural judgments -- not always sinful or evil judgments, but just natural judgments, when suggestions were made to Him, when persuasion was brought to bear upon Him, and when men projected their minds. But He knew the truth: 'My thoughts are not your thoughts. My ways are not your ways. There are two worlds. I live in one and you live in the other.' And so His concern for the Father's glory often necessitated the setting of natural judgments on one side and seeking His Father's judgment on the matter. Natural feelings had often to be set aside. He understood them all right. We shall come to that in this eleventh chapter of John, with Lazarus and his sisters. He was very sympathetic and He understood how they were feeling. He truly entered into their human life, but when they sought to persuade and influence Him to act simply on the basis of natural feelings, He thrust it back. He stayed away two days, and did not move until the fourth day when, humanly speaking, it was all too late. The sorrow had run its course. He was not unsympathetic, [84/85] as the chapter shows, and yet, because He has some greater thing in view, He could not just surrender to human, natural feelings. He had great principles which were governing Him. As for His natural, personal interests, He was all the time thrusting them back. It would have been greatly to His personal interest to accept the devil's offer of the kingdoms of this world and the glories thereof, but He repudiated the whole thing. When speaking of His Cross, it might have been to His natural advantage if He had listened to Peter when he said: "Be it far from thee, Lord: this shall never be unto thee" (Matthew 16:22). But He said to Simon Peter: "Get thee behind me, Satan!" You see, personal interests must take a back place: but He was not governed by these things, for His constant motive was His Father's glory. Now before I can go on any further I must return you to the definition of that word 'glory'. It may be that you have heard me give this definition before, but I do not know of a better. What does glory mean where God is concerned? What is the meaning of that word 'glory' when it relates to God? It just means the rebound of God's complete satisfaction. When things have answered to His nature, His mind, when He is satisfied, He is delighted, He is well-pleased, then there comes back something of His own satisfaction, His pleasure. You can put that to the test in your own lives, in more ways than one. Take your Bible and begin at the beginning. When God had created all things for His pleasure, for His glory, and all things were as He intended and commanded, and everything was governed by: 'And so it was ... and so it was ... and so it was as the Lord commanded and said it should be', the end of that was: "And God saw every thing that he had made, and, behold, it was very good" (Genesis 1:31). I would like to have been in the atmosphere of that, in the realm where everything satisfied God, emanated from Him, and there was this sense of His complete satisfaction and pleasure. That is glory! When we come into the new creation, are born from above, on the ground of our recognition and acceptance of the perfect, finished work of the Lord Jesus for our sin, for our salvation (and very often we are better believers at the beginning than we are later on! ), when we come on to that ground of the new creation in Christ where everything answers to God's pleasure, do we not have the sense of the glory? The beginning of the Christian life is so often like that. While we could not explain it theologically or doctrinally, we feel it! 'It is wonderful to be saved! This is glorious!' It is something that just wells up inside of us. And what is it? It is the Holy Spirit bearing witness to God's satisfaction with His Son whom we have embraced with all the knowledge and understanding of Him that we have. We have accepted the perfection of Himself and His work, and there is a reflection, an emanation, of His glory, the satisfaction of God in our hearts. When we get away from that simple trust in the Lord Jesus the glory often fades -- but I must not go on to that for the moment. Move on in the Bible, and you have God's mind completely and perfectly revealed in pattern form in the creation of the tabernacle in the wilderness. It was meticulously prescribed to a detail, to a pin, to a thread, to a colour, to a position, to a measure, and it was all given by God. And the last chapter of that reads: "As the Lord commanded Moses ... as the Lord commanded Moses ... as the Lord commanded Moses." It becomes almost monotonous! It was done as the Lord commanded Moses, and the glory filled the tabernacle. God was satisfied! And you and I know that that tabernacle was only a foreshadowing in type of the Lord Jesus. We move on to the temple, and, again, the prescription, the pattern, was given to David, and it was all perfected through Solomon. When it was finished according to the heavenly pattern, the glory filled the temple, and even the priests could not abide in it. God filled everything with His satisfaction. The Lord Jesus came to His baptism and His great committal, and as He came up out of the water the heavens opened and the Father's voice pronounced: "This is my beloved Son, in whom I am well pleased" (Matthew 3:17). God was well pleased. That was indeed a good foundation for starting His life work! God's satisfaction is the glory, and John says: "We beheld his glory." Then we come to the perfection of His work on the Cross. There is nothing further to be done after Calvary. It is all finished. Oh, believe this, and believe it with all your heart: there is nothing remaining to be done for your eternal salvation. If you try to add something you will lose the glory and get out of the place of God's satisfaction. When the work on the Cross was accomplished, the work of redemption was a finished work, and the sacrifice was well pleasing to God. Calvary was finished, that Son was raised from the dead, and it would [85/86] not be long before the temple received the glory of the Day of Pentecost -- and then what glory filled the house of God! Why? Because Jesus was glorified. Until then "the Spirit was not yet given; because Jesus was not yet glorified" (John 7:39). But when He was glorified the Spirit was given. There you have the Bible background. At the end this glory is seen coming down in the new Jerusalem: "The holy city Jerusalem, coming down out of heaven from God, having the glory of God" (Revelation 21:11). It is the perfected work in the Church, having the glory of God. It is all over, all finished, the battle is won, the course of Christian trial and discipline and suffering is all over, and the glory crowns everything at last because God is satisfied. Have I, on the side of Scripture at any rate, proved the definition that glory is the expression of God's perfect satisfaction? WHY NO GLORY IN OUR LIVES? Now I said that you could put this to the test in your own experience. Some of us have had to go through this experience to learn these things, for they are not just theories. What has been the most miserable time in your life? Well, I can tell you what was the most miserable time, lacking in glory and having all that is not glory, in my life. It was when I allowed the devil to succeed in putting me outside the finished work of Christ by accusation. 'The Lord is displeased with you. He has it against you. The Lord is really, because of this affliction, suffering, trial, and sorrow, not well pleased with you.' Go down under that and the glory goes. And while you stay there, there is no glory, simply because God's ground is this ground of the absolute finality of the work of His Son for our redemption. Get off that ground by any accusation or condemnation of the devil, forsake the ground of Christ, and the glory goes and will never come back while you stay there. Make no mistake about that! If you are occupied with yourself how long is it going to take you to learn that that is not the ground of glory? Well, it will take just so long as you stay there on the ground of this wretched, miserable self that God has finished with in the Cross of His Son. If we move over on to the ground of Christ and His perfection, and by faith put our feet down on that, then the glory will return. We have only opened the door to this matter, but we really have to apply all this, for I do not want to give you a lot more teaching for you to put into your heads. I have prayed that the Lord will use His word as a shaft to cut in and really do something. IS GOD TO BE GLORIFIED IN OUR LIVES? First of all, it means exactly the same for us as it meant with the Lord Jesus, for He was here as our representative Man before God. Therefore it means the great and utter crisis committal. Oh, let that word get hold of us! There are Christians, and there are committed Christians -- and I must just leave that with you. The great crisis experience in the life of the Lord Jesus was when He made the great committal to the glory of His Father and said: 'Everything from this day is going to be judged by the value of how much glory there is in it for My Father.' That was a crisis, and then, as I have said, everything did fall into line with that where He was concerned. He saw to it that His conduct, His own life with His Father, His secret life which no one saw or knew, and His life before the world, before people and before His disciples, were governed by this one thing -- His Father getting the glory. His behaviour, the way He spoke and the way He acted were all governed by this one thing. If He had been a business man, it would have governed His business transactions. Were they to the glory of God? If not, He would not have had anything to do with them. His family, His brothers, sisters, mother -- 'Is My family to the glory of God?' Is the behaviour in our families, in us, in our children, in our husband and wife relationship, in how we go on as a family, to the glory of God? How do people looking on view it? This is searching! But if you come to a position like that where you really have a transaction with the Lord, do not think that it is going to mean a life of loss. No, you are going to see the glory of God. That is the upshot of this eleventh chapter of John with Lazarus and his sisters at Bethany. Difficult as the way to it was for them, the last picture is of an emanation of the glory of God. What a delightful scene that is in chapter twelve! Jesus came to Bethany, where Lazarus, whom He had raised from the dead, lived, and they made Him a supper. Martha served, in a new spirit of service, and Mary and Lazarus sat with the disciples. It must have been a beautiful time -- real glory in resurrection life. But they had been through something to get to [86/87] that! They had been tried and tested on this question: "Said I not unto thee, that, if thou believedst, thou shouldest see the glory of God?" Do you want to see the glory of God in your own life? It is not going to mean a life of loss, for if you have the glory of God you cannot get anything beyond that, or better than that. - T. A-S. They have Moses and the prophets, let them hear them.... If they hear not Moses and the prophets, neither will they be persuaded, if one rise from the dead" (Luke 16:29, 31). THAT is a strange parable, or illustration, that our Lord gave about the rich man and the poor man and their places and conditions after having passed from this life! How much speculative teaching has been read into or made out of it! And yet, in truth, the Lord was not propounding a doctrine of life after death. Anything in that connection was quite incidental. What He was really touching, as the context shows, is the matter of responsibility. Whenever He came into touch with the existing traditional religious system this was the issue which He deliberately raised and pressed. If the after-this-life factor does have a place in the above story -- and it certainly does -- it is this factor of responsibility which dominates the situation. 5. have failed to realize that every bit of spiritual provision is a trust; it must not stay with them, but must enrich the needy always at the gate, as represented by the beggar -- the sufferer, the suppliant, the hungry. A. Have we available to us those Divine resources, those riches of Christ, those ministries -- personal or printed -- which are intended by God to make us spiritually wealthy and of Christly stature? B. If so, are they just things to us, 'teachings', subjects, themes, 'lines of truth', Christian tradition, interesting and informative treatises, etc? How much are we really 'growing thereby'? C. What is the interest value to the Lord who gave them? Do they stop at us, or is 'our profiting' the gain of others? Not the passing on of truth as such, but the value of our life with the Lord. The Lord has been strong, almost severe in His warning that a very big responsibility lies at the door of everyone who is in touch with His Divine resources, and that what has issued from them will find us out in eternity. - T. A-S.
"THE LOVE OF CHRIST CONSTRAINETH"
"WHAT was it that carried this sensitive man (Paul) with his difficult temperament and ailing body through it all? He tells us about this as he tells us about everything else; it was nothing else but the love of Christ. It is doubtful whether Paul made as many converts in his whole ministry as Wesley made in a year or two; certainly the great world took but little notice of him, and Christian [87/88] literature in the centuries which followed, while it could not ignore him, proves that neither the Church of his own day nor that of succeeding generations really understood him. The Christianity which conquered the world was indeed not Pauline, it was a compromise, and it won the world by incorporating alien elements of which it has not yet rid itself. But, his posthumous influence has been like the man himself, a volcanic ferment rising every now and again to destroy the shelters in which the organised Church takes refuge, and force her out into deep waters again. But all this was hidden from him; his ambition was not to found so many churches, much less to turn the world upside down, or make Corinth a place fit for Christians to live in, but simply to 'share the sufferings of Christ', that is, so to preach Christ that when he saw Him at last, he might not be too much ashamed. It is strangely true that the men who have changed this world have been other-worldly men whose hearts were in Heaven." - Selected. Altoona, Pa. $10; Arnold, Md. $5. Baltimore Md. $5; Chicago, Ill. $10; Crowley, Texas $10; Fort Collins, Colo. $8.20; Fort Worth, Texas $10; Eaglesmere, Pa. $25; Fairfield, Ala. $10; Germantown, Tenn. $4.30; Greeley, Colo. $4.65; Highland Park, Mich. $5; Indianapolis, Ind. $5; Junction City, Oregon $7.65; Kansas City, Mo. $2.70; La Porte, Ind. $20; Longview, Wash. $1.60; Los Angeles, Calif. $20; Martinez, Calif. $20; Medicine Lodge, Kansas $10; Minneapolis, Minn. $9; Montgomery, Ala. $10; Mt. Clemens, Mich. $15; Norfolk, Va. $10; Orlando, Fla. $5; Oslo, Norway $3; Pinson, Ala. $20; Rockford, Ill. $5; San Dimas, Calif. $20; Santa Cruz, Calif. $5; St. Petersburg, Fla. $5; Tokyo, Japan $10; Ventnor, N.J. $15; Westhampton Beach, N.Y. $10; Williamsport, Pa. $5; Woodland, Hills, Calif. $10; Zamboanga City, Philippines $2. Total: $353.10. Corner Brook, Newfoundland $2; Don Mills, Ontario $20; Toronto, Ontario $20. Total: C$42.00.